A bit of mystery about a character’s mental health can stretch a long way. I found “Donnie Darko” compelling because of the fragility of Donnie’s connection to reality – the movie was strictly his, but his what? Visions, wishes, delusions, dreams? It was like watching oil on water. I was therefore disappointed when I learned that the whole thing was intended as straight science fiction. Figuring out sci-fi mechanics can be fun, but not when the whole fabric of the movie had seemed to be up for grabs. All of poor Donnie’s relationships become uninteresting at a stroke. 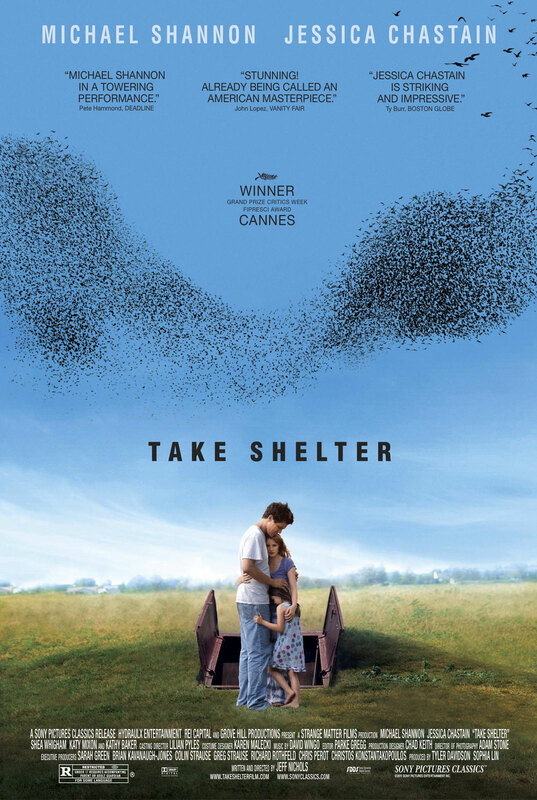 I had something like the opposite problem with “Take Shelter”. It tells the story of Curtis (Michael Shannon), a construction worker who has what his colleague calls “a good life” with his wife Samantha (Jessica Chastain) and their young daughter Hannah (Tova Stewart). Hannah has (presumably quite recently) lost her hearing, and Curtis and Samantha’s strength and tenderness against this challenge shows them to be a sturdy pair who we can trust. Curtis begins to experience vivid, violent dreams and hallucinations of catastrophic storms or violence toward himself or Hannah. We see some of them first hand, stitched into the film as they are stitched into Curtis’s life. They are jarring, and so we can share Curtis’s twin reactions to them. On the one hand he knows that he is ill and seeks treatment, but on the other he cannot shake the terror and pursues real-world solutions to his dark visions, fixating on disassociating from those who hurt him in his visions and on building out the storm shelter on his property in anticipation of the apocalyptic storm. We learn that his mother is a paranoid schizophrenic, in assisted living since her illness manifested when Curtis was around the age that Hannah is now. This experience makes Curtis admirably pragmatic, immediately researching mental illness as the library and making an appointment with his doctor. Small but critical barriers begin to appear: he is referred to a distant psychiatrist but cannot make the long trip. He self-diagnoses as potentially schizophrenic to the local counselor he visits instead, but she is not licensed to medicate him. He talks about his mother’s history and his fears to the counselor, but she is transferred. While the path to a solution based in reality is blocked, the path to “solving” the problems of his delusions is entirely clear. When he asks his work partner for help in breaking company rules to borrow equipment for the folly of the storm shelter expansion, he is indulged. His distancing himself from those who hurt him in his dreams is allowed by his wife and boss, who of course at first have little notion of his mental deterioration. Critically, he easily obtains an ill-advised home improvement loan for the expansion of the storm shelter. It would have been easy to overplay a subtext that here is a hard-working man who is crushed between a healthcare industry that cannot help with his real problems, and a financial industry that enables his folly. Luckily the film’s balancing act between lucidity and delusion is too subtle for that, and Shannon makes Curtis too compelling for triteness. I found it easy to share both Curtis’s creeping dread and his self-aware despair. Because of this, as his tether back to the right path frays, his deluded decisions that would seem so incredible in a vacuum become almost unwatchably brutal. The trick of making the outlandish empathetic is pulled off here as well as I can ever remember. When Curtis finally explodes in paranoid rage, it is not a stereotypical crazed rant but a tragic culmination. When Samantha pleads with him and tries to force him to address his delusions directly, she seems naive rather than strong. But there is a problem. This painstaking, wonderful portrayal of a man grappling against himself and his own demise is inexplicably undermined by a parlor trick of an ending that dishonors everything that has gone before. There is emphatically no question of when and whether Curtis is suffering from visions or delusions at any given moment, until the very last moments of the whole film. Then, suddenly, we seem to be invited at least to entertain the notion that Curtis’s delusions are somehow real. Suddenly nothing is ruled out, and the whole film is up for grabs. I’m sure it is possible to construct as many plausible, coherent explanations for what is going on at the end as we could care to, but why allow this? The solid whole that was so affecting seems to dissolve into an oil slick of interpretation. Perhaps for some this will give the whole more resonance, but I would have been happier if the portrait that had seemed so convincing and powerful had been allowed to stand on its own.